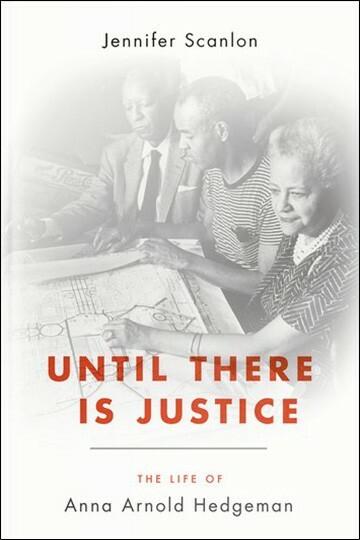 Until There Is Justice tells the complex, moving story of the remarkable civil rights figure Anna Arnold Hedgeman, who played a key role in more than half a century of social justice initiatives. Hedgeman ought to be a household name like her colleagues, including A. Philip Randolph, Betty Friedan, and Martin Luther King Jr., but until now she has received only a fraction of the attention she deserves. Through a commitment to faith-based activism, civil rights, and feminism, Anna Arnold Hedgeman participated in and led some of the 20th century’s most important developments, including advances in education, public health, politics, and workplace justice. She worked as a teacher, lobbyist, politician, social worker, and activist, often behind the scenes but always crafting as well as carrying out policy. She repeatedly found herself a woman among men, a black American among whites, and a secular Christian among clergy, but she found ways to maintain all of those conflicting identities and work with others to forge a common humanity. Hedgeman cared deeply for the dignity and welfare of all people, acting most passionately on behalf of the dispossessed. She helped black and Puerto Rican Americans achieve critical civil service employment in New York City during the Great Depression, directed national efforts for permanent fair labor legislation after World War II, coordinated the first organized attempt by black Americans to influence a presidential election, orchestrated white religious Americans’ participation in the 1963 March on Washington, and introduced a broad and inclusive agenda as a founder of the National Organization for Women. Here finally is the story of this dignified woman and scrappy freedom fighter, devout Christian and demanding feminist, accomplished political operative and savvy grassroots organizer, proud American and insistent African American voice. “Until There Is Justice: Anna Arnold Hedgeman Returns to NYC,” Parts I and II, The Gotham Center for New York City History, March 1, 3, 2016.